Republicans Mitt Romney and Rudy Giuliani had a sharp exchange over their tax and spending records Thursday, reflecting a tightening race in New Hampshire and Romney's desire to make the GOP campaign a two-man fight. The former Massachusetts governor criticized Giuliani for fighting as New York's mayor to eliminate a presidential line-item veto - a provision that lets a president reject specific items in a spending bill - as well as to maintain a commuter tax in New York City. Romney said those actions by Giuliani illustrated the two candidates' differing views on tax policy and government spending, pivotal questions in New Hampshire. The state has a Yankee pride in bare-bones government - and no income tax. "I don't think there's any tool more important than the line-item veto," Romney told a townhall audience at St. Anselm College. "I line-item-vetoed hundreds of items as governor of Massachusetts, hundreds, and that vehicle is the most powerful tool a president of the United States could have to rein in unnecessary pork barrel, earmarked spending." One of Romney's predecessors, former Massachusetts Gov. Paul Cellucci, said in a conference call arranged by the Giuliani camp that the criticism "appears to be some desperation as the polls close." He also said it amounted to "pretty weak arguments from a governor who in four years really had no tax cuts for the people of Massachusetts." Cellucci said Giuliani supports a line-item veto as one of his 12 campaign commitments. Giuliani literature also notes that nearly all of Romney's vetoes were overridden by Democrats in the Legislature. Giuliani has been leading national polls among the GOP presidential candidates, but Romney - a relative newcomer to the national scene - has managed to take the lead in early-voting Iowa and New Hampshire. His strategy is to win one or both and use the momentum to carry him on to South Carolina, his native Michigan and then the 20-odd states that will vote on Feb. 5. However, Giuliani has used direct mail and radio ads to mount a challenge in the early states. A WMUR-TV/CNN poll of New Hampshire voters released last week showed Romney and Giuliani virtually tied at 25 percent to 24 percent. In July, Romney held a clear lead, 34 percent to 20 percent. "I think Romney's looking for a second wind," said Dante Scala, a political science professor at the University of New Hampshire. "He's been consistently on the air pretty much all year, but I think that initial burst of early advertising has run its course. It looks as if he peaked in July and has since been settling back to Earth." Scala labeled another GOP candidate, former Tennessee Sen. Fred Thompson, "a non-factor" in New Hampshire, but said Sen. John McCain of Arizona, who won the 2000 New Hampshire primary, had stopped his free-fall after a midsummer campaign staff shake-up. "My sense is that of all the top candidates, just one of them has to win both Iowa and New Hampshire, and that's Mitt Romney," Scala said. "If he won Iowa, some of his momentum would be blunted if either McCain or Giuliani stole one in his backyard." CBS News political analyst Nicolle Wallace, a one-time aide to President Bush, said a difference in standing between the two candidates is reflected in their different strategies. "Rudy has been riding this wave of national popularity with the hope that he can finish in an un-embarrassing way in Iowa, in a strong way in New Hampshire and then have enough momentum to let that national popularity carry him through in the big Feb. 5th states," she told CBS News national correspondent Byron Pitts. "What Romney is doing is the opposite. He wants to score big and early and then build the momentum at that point." Wallace characterized the growing tension between the two as a "clash of the titans" between the "best funded, best organized" Republicans in the race. For his part, Romney dismissed the latest polls. Likewise, his campaign played down Giuliani's newly reported $11 million in contributions for the summer quarter, a bit more than Romney's $10 million. "My guess is this isn't going to get decided until the last few weeks. And polls are going to bounce all around between now and then. I'm happy to be in the top tier," Romney said. The dispute over taxes and spending began after Rick Hall, a retired machinist from Milford, asked the former governor to differentiate himself from Giuliani on the subject. Hall said he attended a Giuliani forum Wednesday in Windham and wanted to narrow his decision. 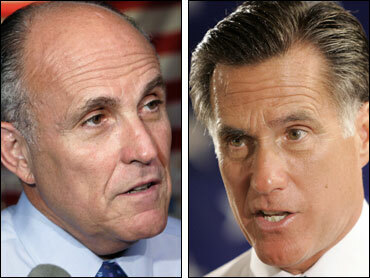 Romney responded by highlighting Giuliani's actions on the line-item veto. In 1997, Giuliani filed a lawsuit challenging then-President Clinton's use of the tool, concerned about its impact on the ability of the city and New York state to raise taxes on hospitals and use the money to attract federal Medicaid payments. A year later, the Supreme Court found the presidential provision unconstitutional. "Because he won, he killed the line-item veto," Romney said of Giuliani, calling the former mayor's action "a serious mistake." On the commuter tax, Romney noted that Giuliani challenged then-Gov. George Pataki, a fellow Republican, when Pataki tried to eliminate New York City's 0.45 percent commuter tax. The tax had existed for decades, and at the time of its repeal added about $500 million a year to city coffers. Giuliani opposed repeal, saying he was putting the city first. The tax was repealed in 1999. Cellucci said that, as governor, Romney closed tax loopholes. One had allowed taxation of vacation pay, deferred compensation and other income for nonresidents of Massachusetts. "The tax burden actually went up 10 percent during his time because he closed a lot of loopholes," Cellucci said.